the Scripture and Hermeneutics Seminar. This annual gathering of Christian scholars from various disciplines was established in 1998 and aims to reassess the discipline of biblical studies from the foundations up and forge creative new ways for reopening the Bible in our cultures. Any attempt to open the Book in new and fresh ways for our cultures at the start of the third millennium must explore how to read the Bible ethically and politically. 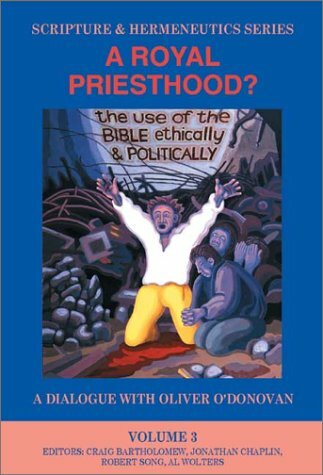 This volume looks at the obstacles to such a process and in dialogue with Oliver O'Donovan's creative work in this regard, looks in detail at how to read different parts of the Bible for ethics and politics. A unique element of the book is Oliver O'Donovan's 14 responses to individual chapters. Volume 1, Renewing Biblical Interpretation and Volume 2, After Pentecost, are also published by Paternoster Press and Zondervan. Karl Mï¿½ller is lecturer in theology and religious studies at St. Martin's College, Lancaster, and senior tutor at the Carlisle and Blackburn Diocesan Training Institute. He is the author of A Prophet in Debate: The Rhetoric of Persuasion in the Book of Amos. He has also co-edited Renewing Biblical Interpretation and After Pentecost: Language and Biblical Interpretation. How Has the Bible Been Used Ethically? Cui Bono? What is at Stake in this Discussion? Response to Daniel Carroll R.
Ethics and Exegesis: A Great Gulf? Acting Politically in Biblical Obedience?